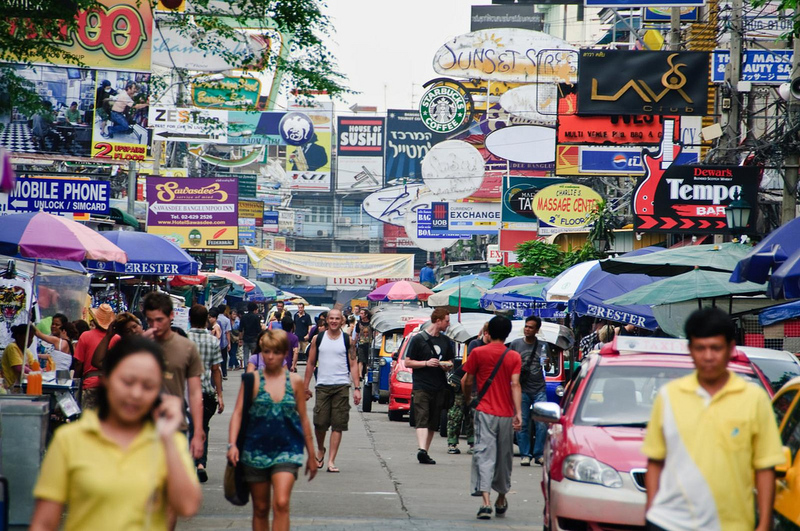 Why Visit Khao San Road? Khao San Road itself is a short street located near Ratchadamnoen Avenue, a major avenue linking the area with Bangkok’s historical temples and palaces. Although Khao San Road itself is small, its backpacker culture of cheap guesthouses, bars and restaurants has spilled over into almost all of the surrounding streets. Throughout the day (and most of the night) Khao San Road is a noisy circus of activity. Some of its surrounding streets, such as the relaxed Soi Rambuttri and hip, arty neighbourhood of Phra Athit Road, are a great escape from the hustle and bustle of Khao San. If you’ve just touched down in Thailand and you’re travelling on a backpacker’s budget, Khao San Road will likely serve as a travel hub during your trip. Phra Sumen Fort near Khao San Road © shankar s.
Street market and party hotspot, Khao San Road is Bangkok’s backpacking capital. Home to some of the city’s cheapest guesthouses and bars, it’s a fun place to spend the afternoon or evening, provided you can handle the hawkers. If the noise and activity of Khao San Road isn’t your scene, Soi Rambuttri — which is about a minute’s walk from Khao San itself — is a quieter, cleaner and more relaxed street that’s home to a range of bars, restaurants, cafés, bookstores and other shops. While the market on Khao San Road is a great place to pick up t-shirts, flip flops and other backpacker essentials, the nearby Banglamphu Market offers a more authentic experience, as well as better prices. Built in 1939 to celebrate Thailand’s sudden transition to democracy in 1932, the Democracy Monument sits in the centre of Ratchadamnoen — a large avenue that’s a short distance from Khao San Road. 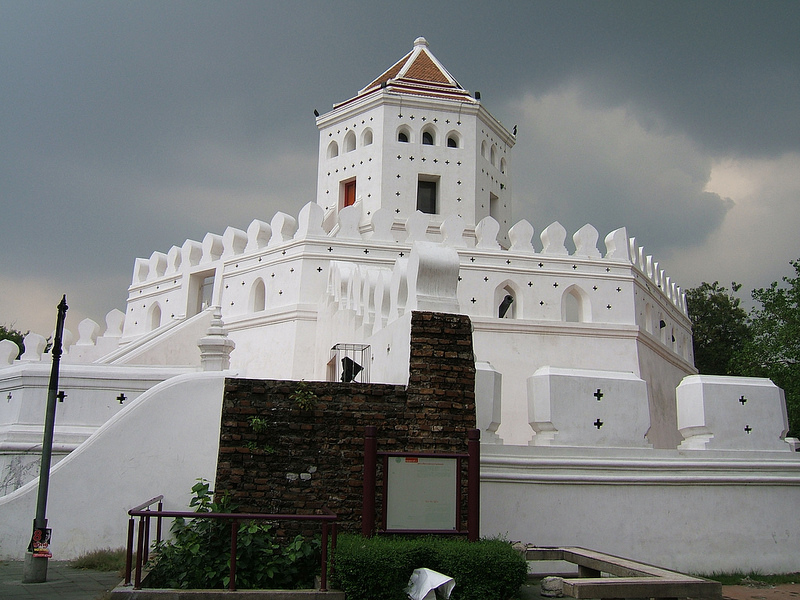 Located on Phra Athit Road, Phra Sumen Fort is one of 14 historical forts built to protect the political centre of Thailand against attack. Today, just two of the forts are left. Phra Sumen is a short distance from Khao San Road and offers great views of the Chao Phraya River. Conveniently located a short walk from Khao San Road, Wat Chana Songkram is a modest but impressive 18th century temple. The temple is home to a beautiful Buddha statue and a shrine to Taksin — the only King of the Thonburi Kingdom. Wat Bowonniwet Vihara is an impressive Thai Buddhist temple built during the reign of King Rama III. Built using a Thai-Chinese style, the temple contains a 14th century Buddha image and is closely associated with Thailand’s Royal Family. Feeling tired and sore? Although Khao San Road isn’t home to many of the luxury day spas you’ll find elsewhere in Bangkok, it’s a great place to stop for a Thai massage. Try one of the numerous inexpensive spas located along Khao San Rd or Soi Rambuttri. Khao San Road is home to a huge selection of used book stores, with everything from travel guidebooks to classics in stock. Try Shaman Bookstore, which has two locations on Khao San Road, for the area’s biggest selection of used paperbacks. Established in 1979, Sor Vorapin Muay Thai Gym is the closest Muay Thai gym to Khao San Road. Far from being a tourist trap, the gym has trained several Thai champions and offers a selection of group and private classes aimed at fighters of all skill levels. A short distance from Khao San Road is Phra Athit Road, a picturesque street that’s easy to access via the Chao Phraya River. Home to a selection of cafés, restaurants and bars, it’s a popular daytime and evening hangout for locals and backpackers alike. Chomp Comfort Café serves burgers, sandwiches and other Western comfort foods, as well as a great selection of strong and inexpensive cocktails. Located on the corner of Samsen Soi 1, it’s a short walk from Khao San Road. Located on Phra Athit Road, Hemlock’s stylish interior, jazz soundtrack and great selection of local artwork makes it a nice place to relax and enjoy dinner with friends. Hemlock’s kitchen is open until midnight, making it a good choice for late-night dining in the area. Finding good vegetarian food on Khao San Road can be tough. May Kaidee Samsen is only a few minute’s walk from Khao San, and its extensive Thai vegetarian menu makes it a fantastic choice for visitors seeking something a little more interesting than streetside Pad Thai. Ranee’s Restaurant serves authentic Italian pizzas, pastas and excellent desserts on Trok Mayon — a small side street that’s connected to Khao San Road. Prices are higher than the average Khao San restaurant, but the relaxing atmosphere and great food makes it worth it. Located on Soi Rambuttri — Khao San Road’s quieter, more relaxing counterpart — Bombay Blues serves a variety of authentic Indian dishes. Shisha and party games like Jenga make it a fun choice for a night out with friends. Tom Yung Kung is a popular Thai restaurant on Khao San Road that offers a nice break from the street’s hustle and bustle. Great seafood dishes and a charming Thai cultural performance make Tom Yung Kung a great place to get acquainted with real Thai cuisine. Open since 1982, Shoshana is one of Bangkok’s few Israeli restaurants. It attracts a mixed crowd of locals and tourists visiting for one thing — the freshly prepared, inexpensive dishes on offer. 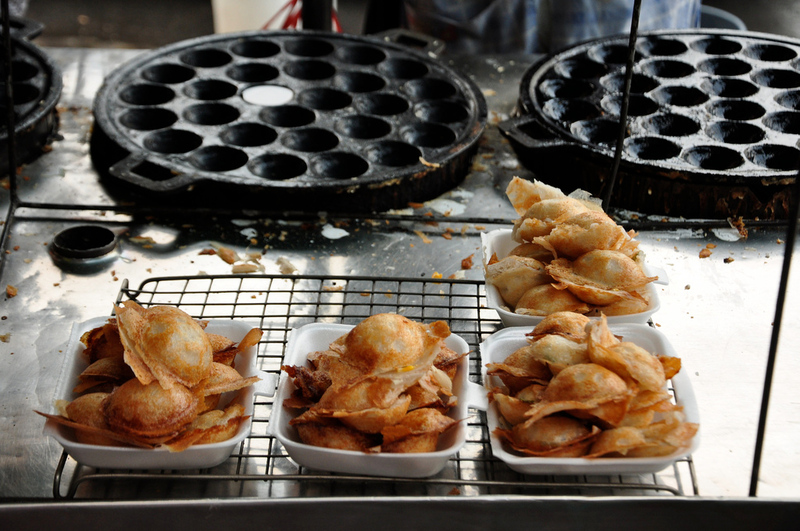 The majority of guesthouse restaurants serve tasty but unremarkable food. Cozy House on Samsen Soi 2 is the exception. This guesthouse/restaurant serves a mix of Thai and Western dishes and attracts diners late into the night. Another Samsen Soi 2 restaurant, Snack Bar Bkk serves great burgers, schnitzel, poutine and a good selection of other Western comfort dishes. Salads and a range of Thai dishes are also available. Located on Samsen Road, Krua Apsorn serves a selection of great Thai dishes. Best known for its crab curry, Krua Apsorn is a favourite of local foodies. Make sure you arrive early, as the kitchen shuts down at 8 pm. Accessible via Thewet Pier, In Love Bar and Restaurant offers a decent selection of Thai food and an excellent view of the Chao Phraya River. More romantic than gourmet, In Love is ideal for couples seeking a quiet, picturesque night out in Bangkok. The Khao San Road area isn’t known for its luxurious accommodation, and SSIP Boutique Dhevej Bangkok is a decent walk from Khao San Road itself. This luxurious four-star hotel offers comfortable accommodation a short distance from Phra Athit and Samsen. Baan Chart Hotel is located on Chakrapong Road, about one minute from Khao San itself. A comfortable three star hotel with a rooftop swimming pool, it offers a relaxing experience in an area better known for backpacker accommodation. Located on Samsen Soi 2, Nouvo City Hotel is a short walk from Khao San Road, Phra Athit Road and Banglamphu’s other popular hangouts. A selection of comfortable rooms and suites make this four-star hotel a great choice for staying in the area. Tara Place is located on Samsen Road, about five minute’s walk from Khao San Rd. Basic but comfortable rooms and a convenient location away from the noise make it a good choice for travellers wanting to visit Khao San Road but not deal with thumping bass all night. Chillax Resort is designed for one thing: chillaxing. This stylish four-star hotel has a selection of huge rooms, all of which include a luxurious jacuzzi. It also has a rooftop swimming pool, making it a great place to relax that’s also within walking distance of nearby attractions. A modern boutique hotel on Samsen Road, Casa Nithra Bangkok offers a selection of rooms and suites located less than five minutes away from Khao San Road. A relaxing rooftop pool makes this modern hotel a great place to chill out and unwind after a day in Bangkok. Located on Trokmayom, Laksameenarai Guesthouse is set back from Khao San Road, giving it a more quiet and relaxing atmosphere than other hostels on the road itself. Dorms and small but comfortable private rooms are available inside a beautiful vintage home. Khaosan Immjai Hostel is located on Samsen Road, a short walk from Khao San and the top attractions in Banglamphu. Dorm beds are available from just 300 baht per night, making it an affordable accommodation option within easy walking distance of Khao San Road. 3Howw Hostel at Khaosan offers a selection of dorm beds, rooms with shared bathrooms and private en suite rooms. The accommodation is minimalistic and simple but clean, comfortable and quiet thanks to its convenient location on Samsen Soi 4. Located about five minutes away from Khao San Road on foot, Siamese Views Lodge offers a range of comfortable rooms. If your budget permits, choose a standard or deluxe room, as the junior rooms don’t have any exterior windows. Korbua house is located on Phrasumen Road, less than five minutes away from Khao San Road on foot. Rooms are spacious and comfortable, with the deluxe rooms offering a good view of the nearby canal. Rang Kha Mhin Home Stay offers a huge range of rooms, ranging from inexpensive dorms to large family rooms. Located on Tani Road, it’s a short walk to Khao San Road, Soi Rambuttri and other nearby attractions. Siri Suvan is a classic guesthouse located a short distance from Khao San Road. Its rooms are minimalistic and comfortable, with the restaurant and terrace offering a great place for guests to relax and enjoy the charming atmosphere. Viman Guesthouse might not be luxurious, but its simple rooms are a great choice for budget travellers seeking somewhere clean and inexpensive to stay. The hotel courtyard is decorated with beanbags and beach chairs, making it a great place to relax during the day. Located on Samsen Soi 6, Roof View Place Hotel offers simple, comfortable and affordable accommodation within walking distance of Khao San Road. Rooms are simple but clean and comfortable, ideal for budget travellers seeking a reliable place to stay. located on the first floor of Buddy Lodge, Brick Bar is one of the few bars on Khao San Road that attracts a mix of Thais and travellers. Cheap drinks and great live music make Brick Bar a fun choice for a night out on Khao San Road. Decorated like a 1960s Americana-style hippie living room, Hippie de Bar offers a nice break from the chaos of Khao San Road. Drinks are strong, the menu is excellent and the music is relaxing, making this a great place to catch up with friends. Decidedly upscale compared to Khao San Road’s other bars, The Club is a neon-filled bar and nightclub playing a selection of modern EDM. Drinks are slightly more expensive than Khao San’s budget street side bars, but the great party environment makes up for it. Upstairs from Brick Bar is Mulligans Irish Bar — a fairly typical Irish pub that attracts a mix of tourists and locals. While the food and drinks are nothing special, the 4 am closing time gives Mulligans a sizable crowd once other bars nearby have shut their doors. Khao San Road’s quieter, more relaxing counterpart around the corner is a fun place to spend a night out. Cross Chakrapong Road (turn right from Khao San and pass the police station) to make it to the section of Soi Rambuttri that’s closed off to traffic. Just along from Soi Rambuttri, Phra Athit runs along the Chao Phraya river is home to a small park and some pleasant eateries and bars, catering mainly to bohemian and student Thais along with tourists looking for somewhere a bit quieter. A tiny, hole-in-the-wall blues pub on Samsen Road, Adhere the 13th attracts a mixed crowd of hipster Thais, expats and travellers. Live music starts at 9 pm and continues until shortly after midnight, making Adhere the 13th a fun choice for music lovers seeking somewhere hidden. Khao San Road is close to the Chao Phraya River, making the Chao Phraya Express Boat a great way to travel around the city. Phra Arthit Pier (N13) is about 10 minutes from Khao San Road on foot, as well as conveniently located close to local temples and attractions. Khlong Saen Saeb — one of Bangkok’s main canals — is a short walk from Khao San Road, making it easy to access Ratchaprasong and Sukhumvit by boat. 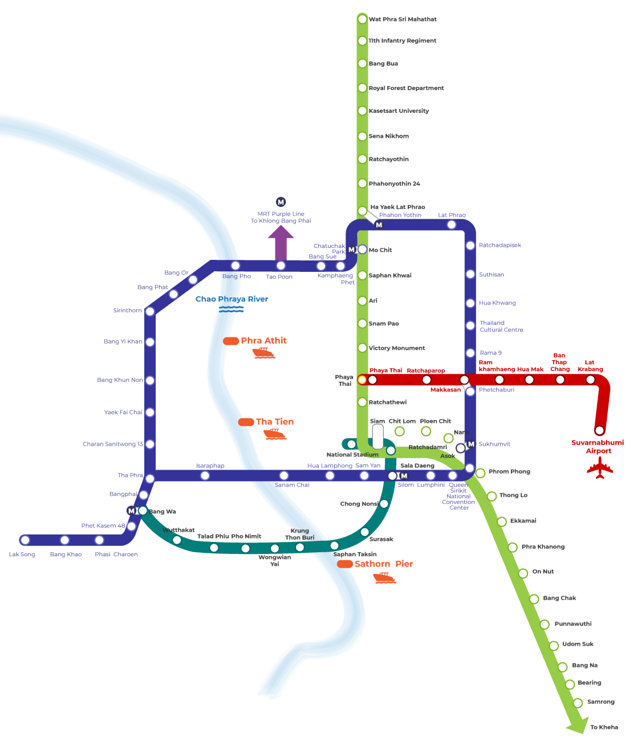 Walk up Ratchadamnoen towards Wat Saket, then catch the Express Boat from Panfa Leelard Pier.